Surveys indicate that a growing number of households rely exclusively on cell phones. Back in the old days the most fun you could have with the phone was the party line. That was when you would have more telephones on a circuit than you had lines going out. When the lines were full you could listen in on calls. We finally got a private line in 1967. I think it cost maybe $3 extra each month. We have a "landline" but it is provided by the cable TV company and has been known to fail occasionally ; my own fault I suppose because I wanted to cut down on the number of individual providers I had to pay each month and I have a grudge against AT&T which I won't elaborate upon here. And I don't even own a cell phone much less those fancy ones they have now because nobody has the privilege of bugging me wherever, whenever. Far cry from the black metal monster that moved with us in 1961 from our apartment to a house ; the "phone company" had to disconnect and reconnect it, it was theirs and you rented it. I'm not ready to give up my landline. Although I have cordless phones now, I still have one trimline phone plugged in downstairs just for use during power outages. And believe me, I'm glad I do because I've used it more than once during the 3 or 4 outages we've had over the past year. I have a cell-phone too, but with my luck, the battery would be run down when an outage occurred. Once we switched to a corded phone connected to a broadband router (no longer using true phone lines), the whole corded phone argument vanished. Although, the cable router does have a battery in it -- I guess I should test this. If the power goes out, then perhaps a corded phone plugged into the battery backed up cable router (doing the phone service) will still work? Huh. For a single person, perhaps, I can imagine that. And perhaps there's less of a need to yell, "Honey, it's for you!" when calls come in on each individual's mobile. But with a mobile, if you need to have another person in the household join the conversation, the speakerphone is about your only option (or maybe a 3-way call, I guess). And to have them pick up the call? You have to give them your mobile. And what do you do in a big house... carry your mobile with you everywhere? 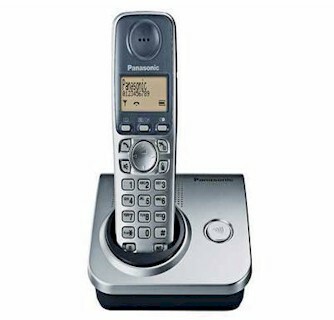 I also don't understand the people whose only home phones are the cordless variety such as pictured here, or the new VOIP phones. In a power outage, you're stuck. (I understand that some have backup battery power that can last a few hours, but is that enough?) Corded phones generally continue to work when the power's out. That's a safety issue; I think everyone should have at least one corded phone.